FocusTwist is an iOS app that lets you take refocusable images with your iPhone or iPad. It works by taking several images at different focus settings, and creating an interactive twist that you and your friends can interactively refocus later. Click on the twist of our 'ville to explore the range of focus you can capture in just a few seconds. Use FocusTwist to share experiences in a whole new way. Reinvent your travel, food, outdoor, and lifestyle photos. Connect with us to see the best twists and learn about product updates first. A 2$ app that re-focuses photos like a $400 Lytro. To make a great twist, frame your shot with an object in the very close foreground and a large object in the background. If you skip this, your twist will be boring. Also, hold your phone still during the few seconds it takes to capture. 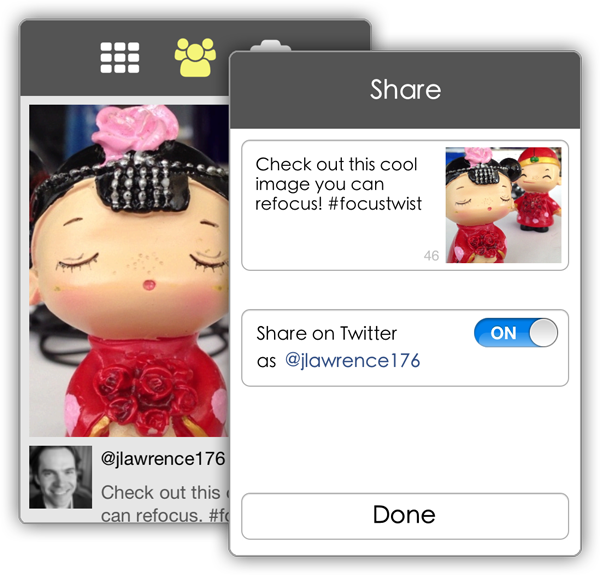 Instantly share your twists on Twitter directly from FocusTwist. The app also has a feed that shows recent twists taken by other users. Add the tag #focustwist when you tweet your twists and they'll be considered for the feed.